All The Little Extras: Eyebrows: There should be two! I wax my own eyebrows for 3 reasons; a) I don't trust anyone else to wax them exactly how I like them, b) I'm really lazy when it comes to making beauty appointments and lastly c) I usually only realise I'm in desperate need of a tidy up when I'm getting ready to go out somewhere! I use Nair Salon Divine Sensitive Wax which is a hard wax that you don't need cloth strips to use. You just pop it in the microwave and zap until its the consistency of honey. 1. This is my eyebrow with a couple of weeks worth of regrowth. Ick! To prepare for waxing, make sure there's no trace of foundation or moisturiser on your face. Dust the skin with transculent powder to make sure the wax sticks to the hair and not to your skin. 2. I like to draw guides for myself with a white eyebrow pencil. Since I'm usually just maintaining my brows rather than re-shaping them entirely, I just follow the line of the hair (what's left of it anyway!). If you do need a re-shape, then this is where I would recommend you go to a professional. Then, making sure your wax isn't too hot (test some on the inside of your wrist), apply as shown in the picture, making sure you apply the wax in the direction of the hair growth. Remove the wax in the opposite direction. 3. I like to tidy up the tops of my eyebrows as well as I tend to grow fuzzy baby hairs there that annoy the living daylights out of me! However, this is a totally optional step. 4. Congratulations! 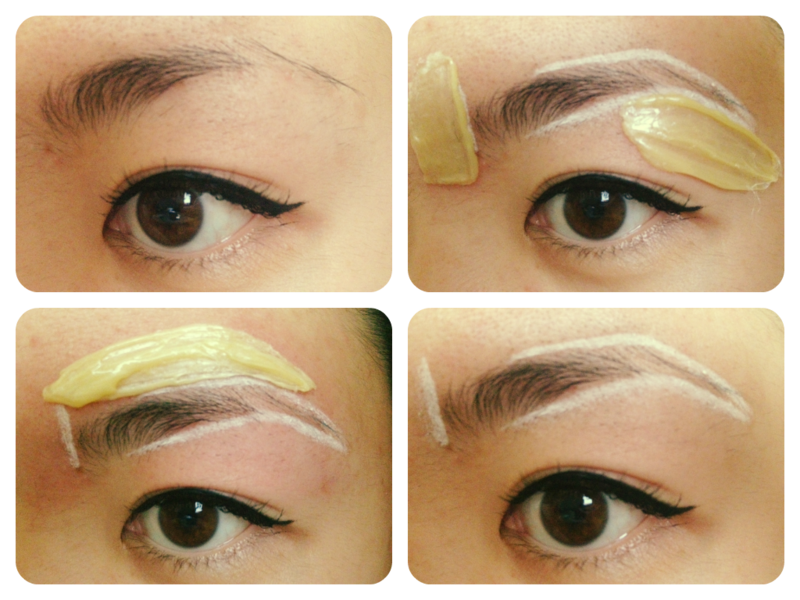 You've successfully waxed your eyebrows! 5. At this point, I like to tweeze any remaining hairs that the wax may have missed as opposed to waxing over the skin again. 6. Using a soothing eye make up remover (I use Neutrogena Oil-Free Eye Makeup Remover) and a make up pad, I remove the white eyeliner. 7. Brush hair into place with a spoolie. 8. Ta da! My waxed but undefined eyebrow! 9. Using a taupe eyebrow pencil (I use Australis Light Brown because it's cheap as chips and I tend to go through eyebrow pencils at an alarming rate), define the brow using short strokes. Start about a third of the way from the base of the brow since the hair is darkest and thickest at the base anyway. 10. 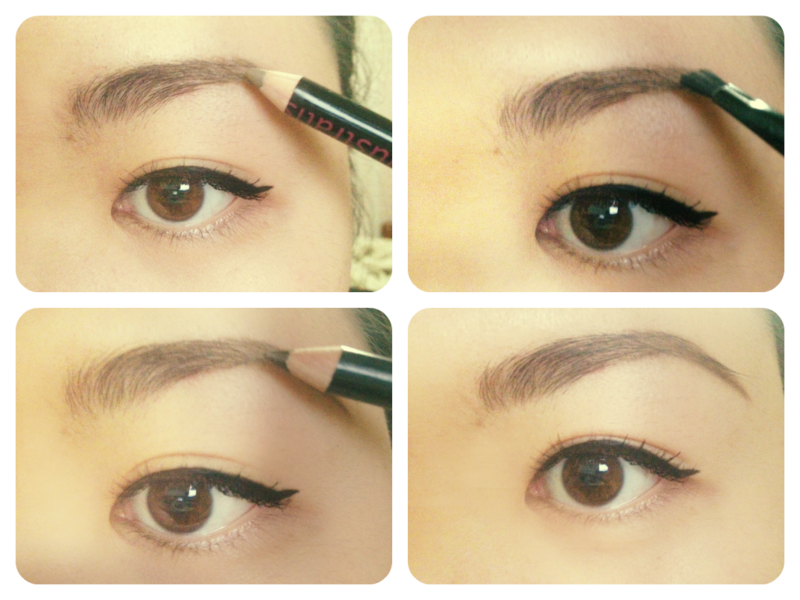 Then go over the pencil with a dark taupe brow powder (I use an unfortunately discontinued L'Oreal one). 11. Again, this step is optional, but I like to further define the tail end of the brow with a dark brown pencil (Australis Dark Brown). 12. Spritz a spoolie with hair spray and brush hair into place to finish. And there you have it! 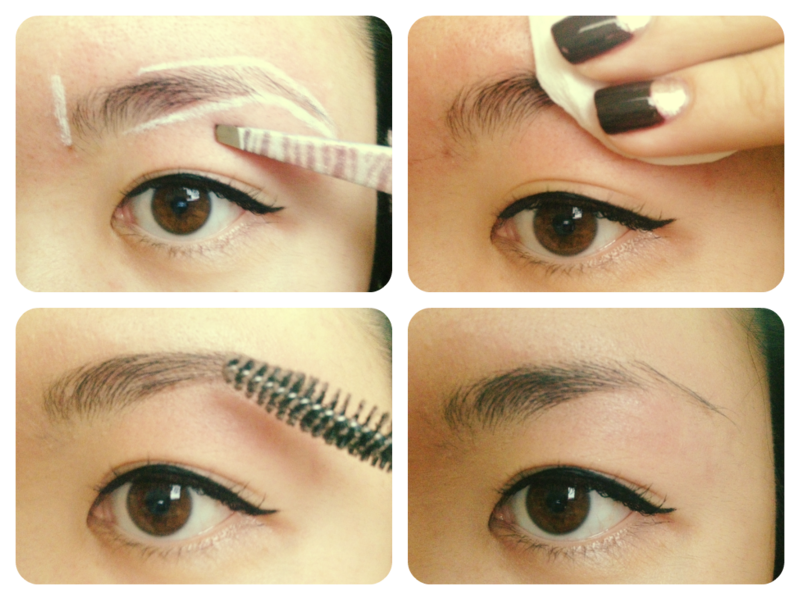 Now obviously, the defining method will work better for girls with similar brows as moi but hopefully I've given you enough tips to make you brave enough to tackle your own eyebrows!